Saturday - Thursday: 10:00 - 18:00, Friday: 10:00 - 21:00. Arriving early is a good way to beat the crowds. Alternatively, coming late on a Friday night is a great way to enjoy the artwork in quieter surroundings. We are comparing Skip-Line Albertina Museum Vienna Prices from leading ticket suppliers and Try to find you Cheap tickets prices on the market. The palace was built between 1745 and 1747 and presented to Duke Albert and his wife as a Christmas gift. Their personal art collection forms he basis of the museums holdings. The Albertina was extensively renovated and re-opened in 2003 and today boasts lavish interiors. It also houses an array of impressive art collections including impressionist pieces and 20th century art. Featured pieces include by Money, Klimt, Da Vinci and Picasso to name a few. Perfect for culture vultures . Your Experience With Skip-Line Albertina Museum Vienna? Take a peak at the lavish Habsburg Palace state rooms including the “Spanish Apartments” where the royal family of Spain once resided. Get access to various special exhibitions with changing themes. Explore the world's largest graphical collection. What Skip-Line Albertina Museum Vienna Includes? For an additional cost you can rent an audio guide and enjoy a history lesson as you explore the museum. Travelers Reviews about Skip-Line Albertina Museum Vienna? 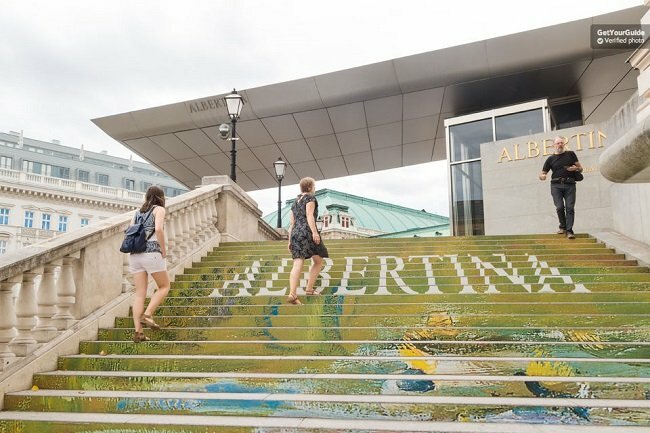 The Albertina Museum is rated 4.5 stars on Tripadvisor with customers calling it a "wonderful display of modern art". And said it was "a great place to spend a Sunday afternoon in Vienna". Albertina Museum is wheelchair accessible. Both printed and mobile vouchers are accepted if booked through Get Your Guide and Tiqets. Tickets booked through Viator must be printed out. Tickets booked through Get Your Guide can be cancelled for a full refund up to 24 hours in advance. Tickets booked through Viator can be cancelled for a full refund up to 7 days in advance. Tickets booked through Tiqets are non-refundable. Access to some state rooms may be restricted during your visit due to conservation efforts. Albertina Museum, Abertinaplatz 1, 1010 Wien.